"Lili Boulanger (1893-1918) was the incredibly talented younger sister of Nadia Boulanger (1887-1979), the Parisian composition teacher whose students included Aaron Copland, Walter Piston, Roy Harris and Virgil Thomson. Lili died at age 24 of Crohn's disease, and the works on this recording show what a loss to the musical world that was. 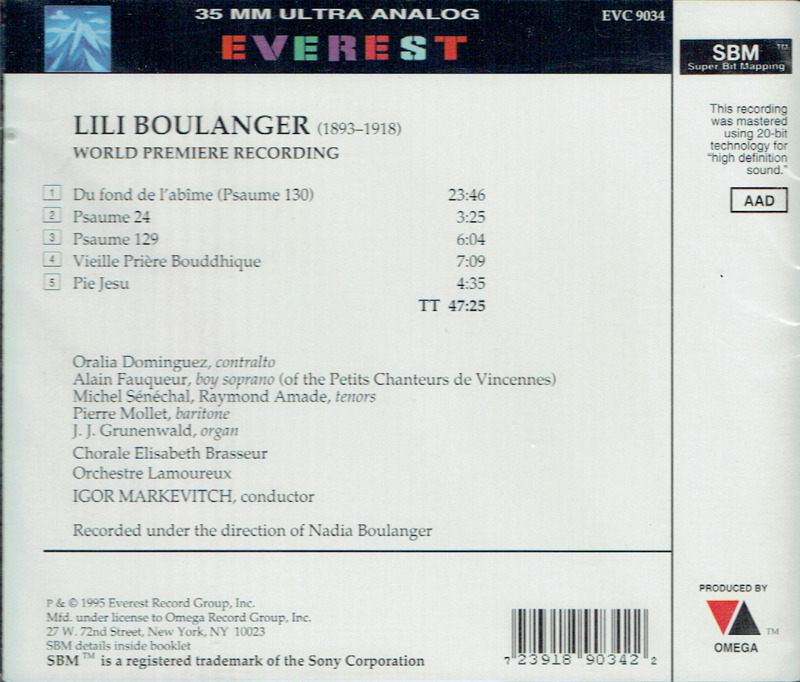 These powerful, moving, well-crafted pieces demonstrate that, had she lived a normal lifespan, Lili Boulanger might well have been the first great female composer. 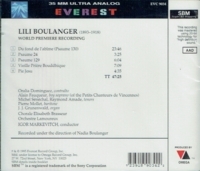 Originally recorded on 35mm film under the direction of Nadia Boulanger and released in 1960, the sound is very good on this 20-bit digital CD re-release. 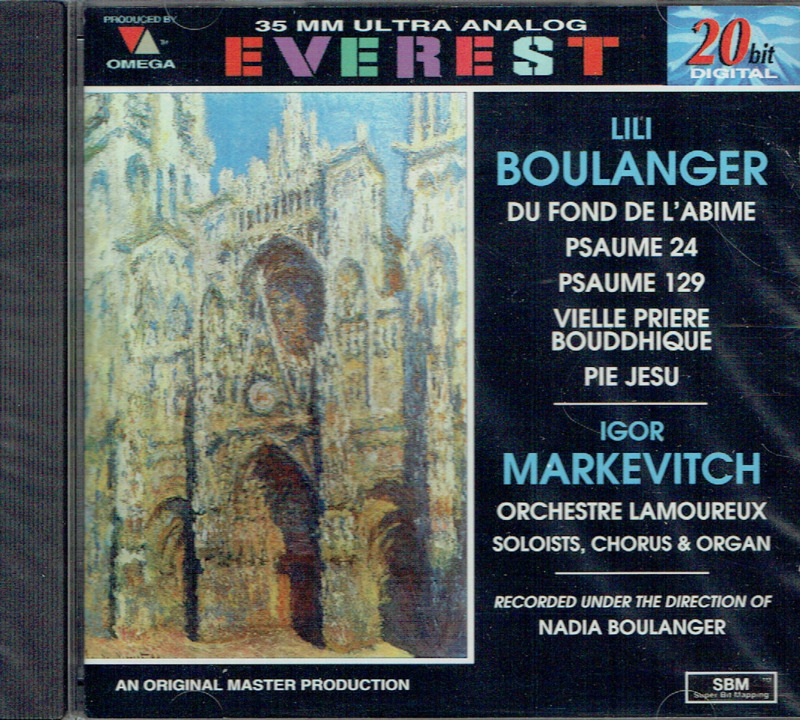 Igor Markevitch conducts the Orchestre Lamoureux, soloists, chorus and organ." "The great Russian conductor Igor Markevitch was born in Kiev and spent his formative years in Switzerland. He studied piano with Cortot and composition with Boulanger, and from the late 1920s until 1939 he enjoyed a successful career as a composer. However, after this period he concentrated on conducting, making a sensational début with the Boston Symphony Orchestra in 1955. He recorded with all the major orchestras, notably the Berlin Philharmonic, Philharmonia, London Symphony Orchestra and Lamoureux, and guest conducted in all the main international centres until the mid-1970s. Markevitch left a very large discography on EMI, DG and Philips." “At 10 Boulanger entered the Paris Conservatory, where for a decade she won first prizes in harmony, counterpoint, fugue, organ and accompagnement (a term covering all aspects of score reading), and studied composition with Gabriel Fauré. In 1908 she was granted Second Grand Prix de Rome for her cantata LA SIRÈNE. (The First Grand Prix came five years later to Nadia's fragile younger sister, Lili, the first woman composer ever to be so honored.) From 1908 to 1918 Nadia taught harmony at the Conservatory. But not until 1948 would she be named full professor, that position in France being thought unsuited to a woman, even her country's most sought-after pedagogue. Meanwhile, Nadia entertained a very public rapport with Raoul Pugno, a famous and fat pianist old enough to be - and who in a sense was - her father. With Pugno she not only gave concert tours but also composed an opera, never produced, on a libretto by the poet Gabriele D'Annunzio. After the deaths in 1914 of Pugno and in 1918 of Lili, Nadia Boulanger stopped composing to become a full-time teacher and occasional performer. When the American Conservatory at Fontainebleau was founded in 1921, Boulanger was its chief draw, at which she remained, except for the war years, every summer for the rest of her life. Tours of the United States resulted in her becoming the first woman to conduct the Boston Symphony and then the New York Philharmonic. Second only to Bach in the Boulanger pantheon came her friend Igor Stravinsky, who habitually supplied his new manuscripts for her perusal. Stravinsky could do no wrong. Indeed, after Stravinsky's espousal of post-Schönbergian methods, Boulanger, who despised serial music, attempted to find some truth in his erring. In the autumn of 1964 I visited her just after her return from Berlin, where she had heard Stravinsky's newest excursion into 12-tone terrain, ABRAHAM AND ISAAC. Asked how long the piece lasted, Mademoiselle Boulanger replied, ‘Does one speak of temporal data where Stravinsky is concerned?’ I later understood: The piece, 13 minutes by the clock, seemed like a numbing hour. All her life she was newsworthy even to philistines, enigmatic even to intimates. Boulanger's fame lay in her femaleness, thus in her firstness. She excelled at what no other woman ever had, musical pedagogy at its highest, but she also gave up what no woman ever had, a composing career. Was this sacrifice, as she later so hotly claimed, because her compositions were ‘useless’, or because she wished to cede the field to her dead sister? She was never an outright feminist, always giving the benefit of the doubt to her male students while overtaxing the females; yet she was acquisitive of the females, ostracizing them should they contemplate marriage. Her old-maidish aspect notwithstanding, Boulanger was a creature of high temperament. The open infatuations with old Raoul Pugno, later with young Igor Markevitch, now seem rife with pre-Freudian innocence, as do intimations of latent lesbianism. She visibly preferred men because they were not in competition with her, that is, with Lili, for beside Lili there was no room for other female composers. Nadia Boulanger's uniqueness (unlike, for example, teacher Martha Graham's) was that she not only dominated what had hitherto been a solely male domain - the instruction of young composers - but in so doing had quenched, once and for all, her creative fires."